EvoCam for Mac is the ultimate webcam software for Mac OS X. 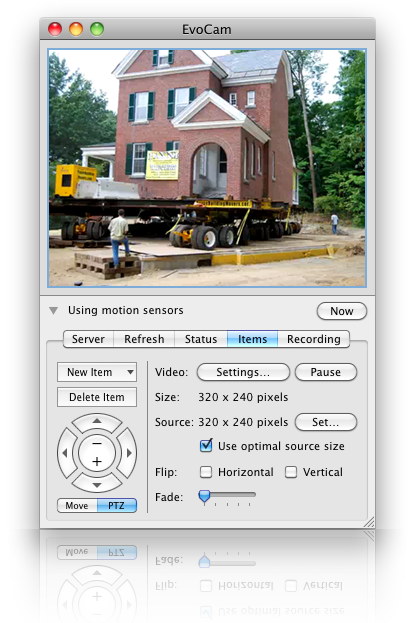 Use EvoCam for Mac to publish a webcam with streaming video, view and record video from network cameras and video servers, create timelapse movies, or use EvoCam for Mac as part of your home security system with its configurable motion sensors - these are just a few of the things you can do with this easy-to-use yet incredibly powerful webcam software for Mac OS X! Use EvoCam to publish a webcam with streaming video, view and record video. ...... using a web browser. The built-in server can be password protected, and you can customize the HTML to give your webcam a personalized look. If your EvoCam server is publicly accessible, you can easily embed your EvoCam stream into a page on another web server. Qweas is providing links to EvoCam for Mac 3.7.4 as a courtesy, and makes no representations regarding EvoCam for Mac or any other applications or any information related thereto. Any questions, complaints or claims regarding this application EvoCam for Mac 3.7.4 must be directed to the appropriate software vendor. You may click the publisher link of EvoCam for Mac on the top of this page to get more details about the vendor.